SamuelWhisky: Swedish Whisky bottled by Bergslagens Distillery – Sherry Darling Ferie 6yo 46% ABV! 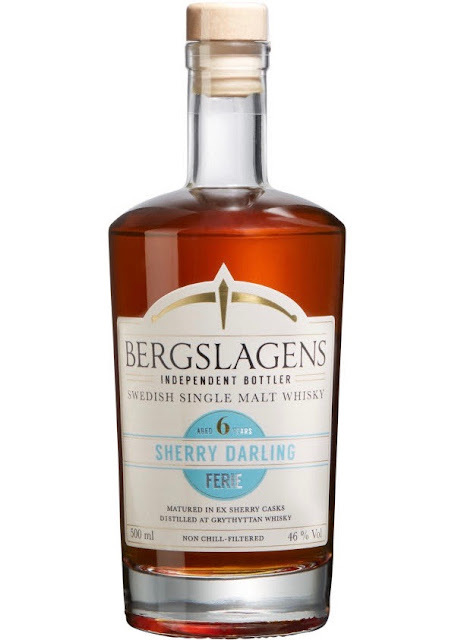 Swedish Whisky bottled by Bergslagens Distillery – Sherry Darling Ferie 6yo 46% ABV! Dear friends, supporters and followers alike! A couple of days ago I was very fortunate to once again receive a sample from the people at Bergslagens Distillery! This time around the label states "Sherry Darling Ferie aged 6 years". This means that this is the fourth release in the "Sherry Darling"-series. As you all know by now this whisky has not been produced or distilled by Bergslagen Distillery but it was distilled at the (now closed) Grythyttan Distillery. This is in other words an independent bottling by Bergslagens Distillery. As you might remember from my previous reviews of whisky sold by Bergslagens Distillery, I have been complaining about lack of information in the press releases. But now my dear friends it seems that my complaining has finally payed off! ☺This time we actually do have info on origin of the casks used and origin of the sherry used, yay! The whisky has been matured for 6 years in 50 litre sherry casks made from american (white) oak. The Oloroso sherry is from the Cádiz province of Andalusia in southern Spain. Unfortunately the pressrelease does not state if it is 1st-fill, 2nd-fill etcetera. Nor does it state number of casks used and number of bottles released and/or produced. The whisky has been bottled at 46% ABV and will be released at the swedish state monopoly tomorrow (the 2nd of May) and you can view it by clicking here. Ok, let's see what we have here! A very creamy, broad, and dry style of sherrynotes in this one. There is a medium big vanilla, traces of salt liquorice, and interestingly enough for being a sherrymatured whisky there are evident traces of spruce/fir (usually I only find this in whisky matured in new swedish oak). Actually, there are very, very slight traces of peat lurking around somewhere in here. Also very, very slight traces of gun powder (some of you may refer to this as sulphur). Last but not least definitely something reminding me of very lightly hopped lager beer. The strength is perfectly balanced against the nose! Starts of rather sweet on raw-sugar syrup infused with dried figs and sugar coated medium dark raisins. After that comes a distinct touch of dry oloroso but most of all caramelized almond paste. This then moves on into a semi-explosion of more dryness that actually evolves into a very, very light touch of peat (! ), slowly evolving into gun powder and ending with marzipan and sweet liquorice. So, was 46% ABV a sucessful move? Well, as mentioned above the strength is definitely perfectly balanced against the nose. I do however find the taste just a bit ”light”; slightly lacking a bit of body and/or depth, but all in all this is in no way and issue. What we have here folks is all in all a very drinkable and well composed sherry matured whisky and I do believe that it will be a perfect everyday dram for the mellow swedish summer! Sláinte! Big thanks to the guys at Bergslagen Distillery for the opportunity to try this release and for the opportunity to be able to review it before its release! Please make sure to follow my FB-page by clicking here, my instagram by clicking here, and my twitter-page by clicking here. Copyright © and All Rights Reserved on all tasting notes and text by SamuelWhisky and pictures likewise belong to SamuelWhisky, unless stated. If you would like to use any such material that belongs to SamuelWhisky or associated with SamuelWhisky, please ask by sending an email to samuelkarlssonorebro [at] gmail dot com and by stating the source.